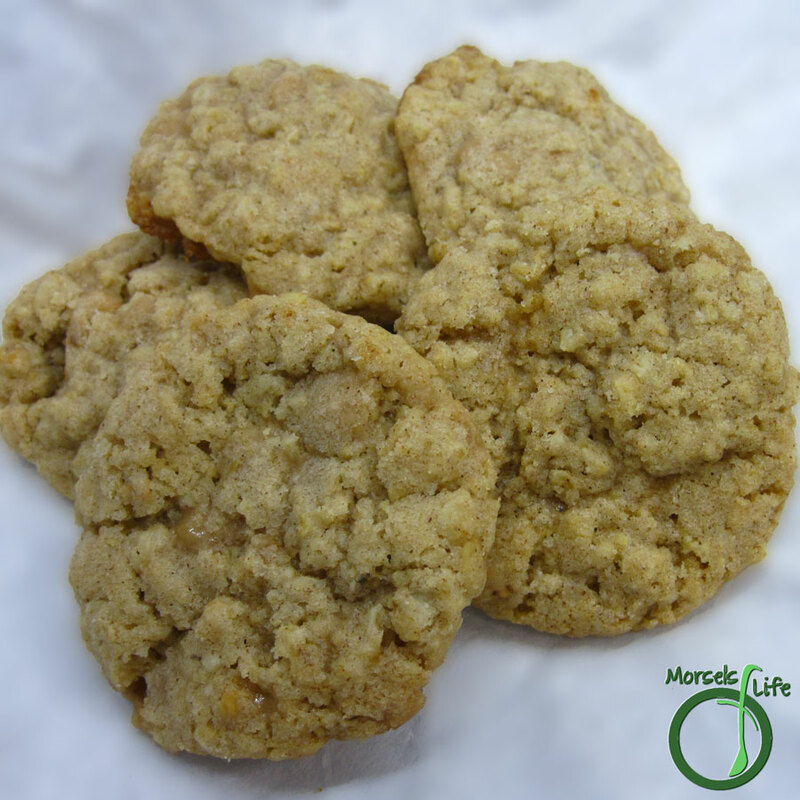 Crunchy oatmeal cookies with a crisp surface, enhanced with toffee bits. I haven't posted a cookie recipe here in a while, but with the holiday season and cookie exchanges coming up, it's about time to share these oatmeal toffee cookies with you! Don't let the oatmeal scare you off. I'm not a huge fan of oatmeal in cookies, but in these cookies, it just works. And it's not just me - I had a coworker tell me the same thing after trying a cookie. Luckily for you, these cookies are not only tasty, but also easy to make. You can even make the dough ahead of time. Just keep it refrigerated or frozen in preparation for when the need arrives! If you only want a few cookies, there's nothing wrong with making a batch of dough, but only baking a few with a toaster oven and freezing or refrigerating the rest of the dough. In addition, since these cookies are easy to store, the cookies would work well as a "make ahead" cookie for those holiday cookie swaps too! What are some of your favorite cookie swap cookies? Form the Wet Team by mixing butter, egg, brown sugar, and vanilla extract. Form the Dry Team by mixing flour, baking soda, cinnamon, toffee bits, and oatmeal. Introduce the two teams, and bake at 375F until golden brown and delicious! Hi morselsoflife.com owner do you have facebook fan page?